This is one of the older dogs (18th century) that is of American origin. It is believed to have been bred originally somewhere near Wisconsin and Minnesota. 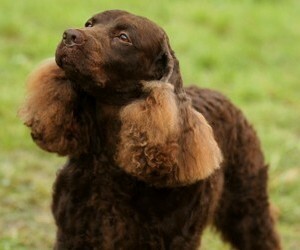 Its breeding stock are believed to have consisted of the Irish Water Spaniel (non shedding) and Curly-Coated Retriever (shedding). Its first major claim to fame was that it was the first US breed dog that could retrieve using a boat as a base, and hunt well on land. With all of this physical prowess it is not hard to understand that the American Water Spaniel is an active muscular hardy dog. However along with this is it very intelligent and easily trained. It is a true working dog that looks to please its owner and will go to extraordinary lengths to retrieve its quarry. The original hunting prey were duck, pheasant, quail, grouse and rabbit. Along with the hunting side and intelligence they are surprisingly sensitive, so training must be done with calm assertive techniques that give it confidence in its work. The intelligent fun nature means that as a companion dog they are generally very good with children. They need to be socialized early to avoid being timid, and through the rest of their life so that they can interact with dogs rather than focus on work matters (such as fetching balls in a companion dog setting). Lack of regular exercise can make for a dog that snaps, barks and whines and shows over-excitement and separation anxiety (much like its shedding cousin the cocker spaniel). This dog has a DOUBLE coat that is either wavy or curly. Colours come in brown, liver with the occasional white areas. Because this dog spends so much time in the water, it has been evolved to have an oily coat to repel the water. This means that while you only need to brush it twice a week, you need to be careful of washing it often as it will remove the oils from the coat and skin which can lead to skin issues. The oil also makes a strong smell on the coat. While this dog is listed on this non shedding site, it is actually a light shedder.